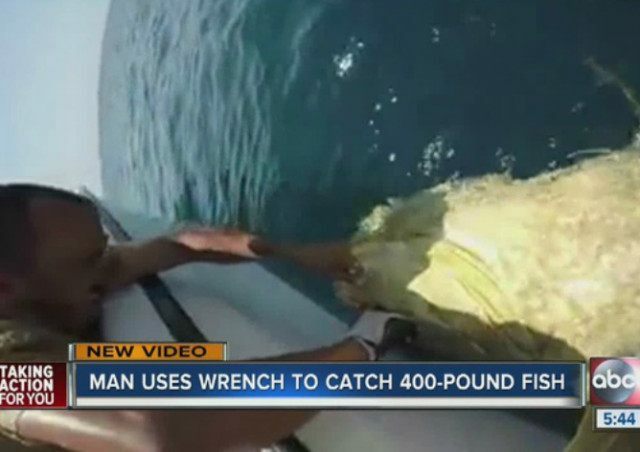 St. Petersburg, Florida, resident Ryan Hein says he “couldn’t believe” that he was able to pull in a 400-pound Goliath grouper with nothing more than a homemade jig, two hooks, and a number-11 wrench. Hein says all he did was attach two hooks to a lure, tied it to a line, and dropped it in the water. Before long, Hein was pulling a fish much larger than he had ever expected. Luckily, Hein’s two friends had a GoPro camera recording the amazing catch. “I couldn’t believe the gear held up and we landed the fish. That was just as unbelievable for me as using the wrench itself,” Hein said.